Yes, it's leap year so we have an extra day this month. It is necessary to add one day to the year every four years to bring the calendar up to date with earth's actual orbital period, which is slightly longer than 365 days. It's a "catch-up" day, so to speak. According to Those Were the Days, Today in History, there seems to be some confusion about who made the decision to add the day, however. By tradition, woman can propose marriage to men during a leap year. Watch out, guys! It's a lovely day today, in the high 50's. It's a very welcome change. 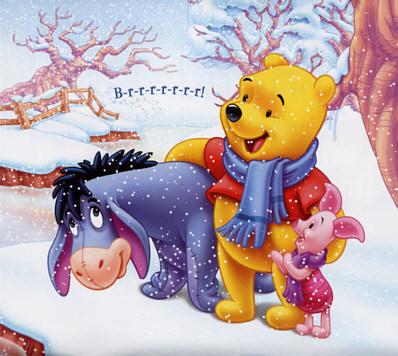 Pooh's smelling the spring flowers already! Get it? Frog, leap frog? Yeah, I know. It's a stretch! p.s. On a personal note, my apologies to my son, Billy, for not posting his 22nd birthday on February 17! Happy birthday, kid. Not much new this week since I was on vacation. It was nice just hanging out, even though my days at work are short these days anyway. Track starts March 8 and ends mid-May and, of course, the two ASL courses are scheduled from next Monday until early June. So, I'll be busy for a few months and then it will slow down again. But the weather is improving and I have some shows to look forward to. Sue and I will also be interpreting five shows from March until September. Since we're finally getting our act together and publicizing it early, I hope the attendance will improve. I'll post that information here when I have everything, which should be soon. I always look forward to Easter as an easier holiday to handle. As much as I love Christmas and Thanksgiving, it can be stressful with the added chores and such. Easter is easier as far as cooking is concerned and the shopping is minimal. It also means that spring is either here or on its way and that's nice to look forward to. I learned from Those Were the Days, Today in History that on this day in 1842, John J. Greenough of Washington, D.C. patented the sewing machine. I never realized the sewing machine existed as early as 1842. I do remember reading a quote from the daughter of Laura Ingalls Wilder (Rose Wilder?). She was asked about machine-pieced quilts and whether or not she felt that the traditional paper-piecing was better. Her reply was something to the effect that she felt sure if her mother had access to a sewing machine that would make her work faster, she would have taken advantage of it. I was once told that using a knitting machine is "cheating". I don't feel that way. If you can get some of the work done quicker, why not take advantage of that? I have enough trouble finishing machine-pieced quilts. I'd never get it done if I did the work by hand. With a machine, sewing or knitting, you still need to have the skill to make that machine work so you're still doing the work by hand. I won't give up hand knitting, though. There's something satisfying about making something entirely from your own two hands. Well, I suppose I've rambled enough. Time to do something constructive with the day. Happy flowers and candy day! This is a very traditional Valentine's Day house. I do indeed have flowers and candy in the form of a dozen roses and a Whitman's sampler, thanks to my sentimental hubby. I don't know where this week went! I feel like I got very little done. Not that it matters. I can catch up on cleaning this weekend. But we actually went two weeks without food shopping, which is odd. We never do that. The cupboard is just about bare and we'll need to shop tomorrow but it's strange that we didn't run out of everything sooner. It just seems the week flew by. Kelly, Jan and I saw Douglas in a reading of The Importance of Being Earnest on Monday evening. It was a funny play and Douglas was very funny and charming! We also had dinner in a nice luncheonette and after the play, took a cab ride to the restaurant where Lori works to visit her. Jan had an appetizer, Eric had dinner and Kelly and I had dessert. Thank goodness the waiter knows them and wasn't too confused by us! We had such a nice time. I may be dating myself here but I clearly remember sitting on the living room floor watching this performance on TV. It's hard to believe that was forty years ago. Whew! I attended Deb's birthday celebration at Barrymore's this afternoon. We had a great time! Deb's Mom, Jane, and Jody did a great job organizing this surprise. Jody made up a gift, what looked like a show poster, "Deb's Birthday, The Musical". We all signed it in gold or silver ink. I brought the cupcakes (fat free angel food cake). Jody asked Deb trivia questions about the historical events associated with Feb. 7. Here's a sample picture (Stephen Hope, Deb, Ron Bohmer). Other pictures can be found in my online album. 40 years of American Beatlemania! 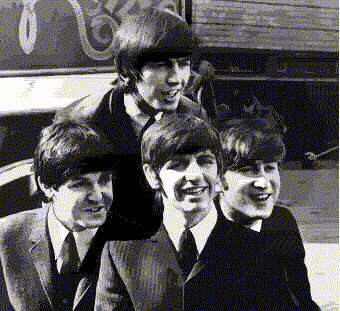 1964 - More than 3,000 fans jammed Kennedy Airport in New York as Beatlemania invaded the U.S. 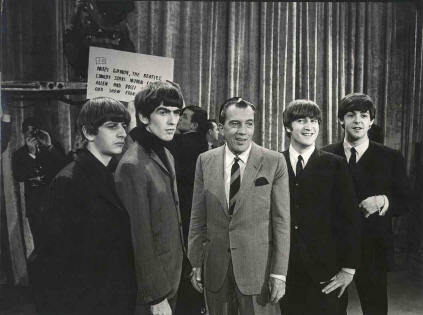 The Beatles, John Lennon, Paul McCartney, George Harrison and Ringo Starr arrived for their first U.S. visit (including an appearance on The Ed Sullivan Show). The ‘Fab Four’ controlled the top spot on the pop music charts for the next 15 weeks and owned the top of the album charts for 10 weeks. Meet The Beatles, indeed! According to those were the days, February 6 is the point when winter is half over. I'd say that's worthy of celebration! Here's the new doorway. It looks really nice and keeps the house warmer. Don't be fooled by the lack of snow, it's still there, just not in this picture. And, of course, snow is in the forecast tonight but only about 1-3 inches. It should change to rain tomorrow so maybe it will clean up the remaining snow. I found out today that track starts March 8. I should enjoy the relaxation of February! While it may not be warm enough to gather daisies, the weather has improved considerably. After a rainy day yesterday, we had sunshine and temperatures in the 40's today. It almost felt like spring. The snow is starting to melt and I'll be glad when that mess is all gone. We have a new entrance door and storm door in the front. We intended to have a new storm door only but the framework around the door was rotted and the storm door could not be installed. So, we also had to replace the entrance door. It took the installer eight hours to complete this job, since he had to replace the rotted wood. It does look beautiful, although we didn't intend to spend quite that much! The joys of owning a home. Anyway, I'll take pictures in a couple of days. Stuffed peppers for dinner tonight! Well, according to CNN.com, the groundhog saw his shadow today so we should expect six more weeks of winter. Why am I not surprised? How often does this groundhog NOT see his shadow? Think about it. The poor little guy is in this hole, or whatever, trying to hibernate for the winter, and these crazy people party all night and then as the sun is coming up, they pull the sleeping groundhog (or woodchuck) from his cozy, warm home and hold him up with bright TV lights in his face. I don't know about you but I'd run right back in that little burrow! Who came up with this tradition, anyway?! According to those were the days, this has been going on since 1887 and the CNN article says that the president of the "Punxsutawny Groundhog Club" says that he doesn't care if the woodchuck sees his shadow or not, this is a "people holiday". Oookay. So, what was the deal with Janet Jackson and Justin Timberlake at the Super Bowl halftime show? I can't say I was exactly watching it. I was knitting so I was just listening to it. Apparently, I didn't glance up at the screen at that opportune moment! And from what I understand, the camera was yanked immediately. Timberlake claims it was an "unfortunate wardrobe mistake" or something to that effect (I'm too lazy to link this story, you've all heard about it, I'm sure). Yeah, unfortunate, I'll bet. I'll also bet that MTV won't be doing any halftime shows any time soon. Hmmm. Brrrrrrr is right! Although, I see from the forecast that relief is in sight in the form of temps in the 30's. Who ever thought I'd think 30's was "warm"? At this point, I'll take anything I can get!